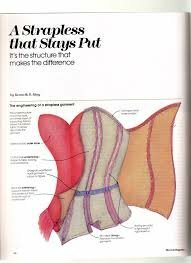 If you have ever made a strapless garment, you know how difficult it is to make a garment that fits well and stays in place. This book is expanded from an article Kenneth wrote in the Threads Magazine. After a brief introduction, the steps to a well-fitting strapless pattern are covered. (He based this book on THE MOULAGE, so if you don't have it, I recommend it). From there, materials for construction are covered, along with a resource list. There are types of construction covered - bustier construction, which is a garment that stops at the waist, and a corselet, which is an inner foundation to support a full length dress. A section on high, faced waistbands, which also utilize this techniques, are also covered. Illustrated with lots of photographs in color.